Well Ladies, it's that time of year that I start planning out our troop's year end Court of Awards ceremony. I like to save the last couple badges the girls earned for their ceremony along with our Cookie Awards. We try and make this day as special as we can as we close the year. You can purchase the printable banner below! For your next Court of Awards or troop party this is the perfect troop party banner! Colors are Mint/light green, dark green, and pink. ***Digital file only. Your purchase will be for a printable digital file that you can print off of your own computer. I recommend using a thick cardstock for the best look and durability. There are no refunds on digital products due to the nature of the item. 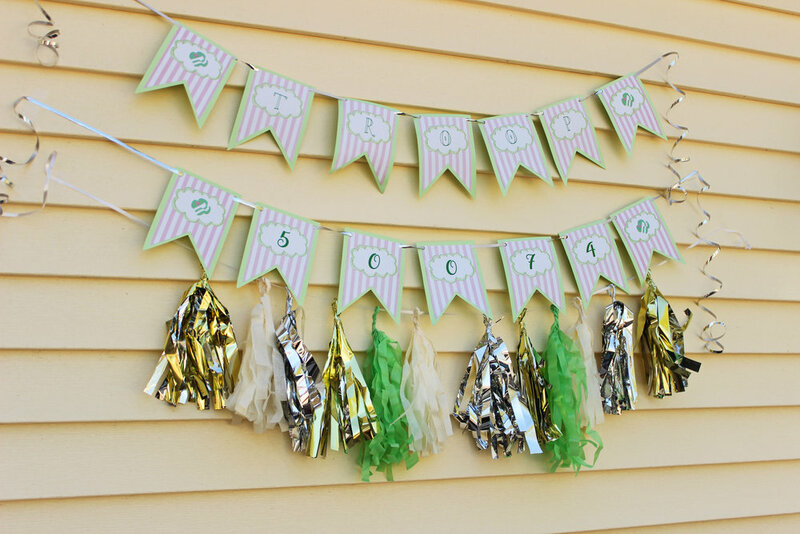 Posted on May 18, 2017 by Katie D. and filed under Girl scouts, Celebrate and tagged troop leader girl scouts printable party banner leader other troop parties girl scout parties.